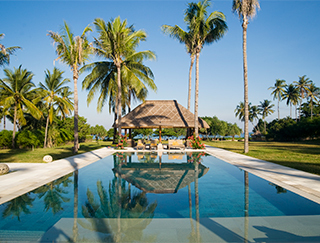 On Lombok’s secluded Sire Beach, luxurious six-bedroomed Villa Sepoi Sepoi has a 20-metre pool, bar, Wii and WiFi. Staff include a chef, manager and housekeepers. 12-16 people (3 with kings, 2 with twin beds and 1 with queen). Extra charge applies for over 12 people. 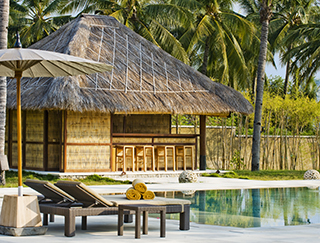 Large open-sided living pavilion; dining pavilion; poolside bar; massage balé and media room. 20m x 7m x 1.5m. Villa manager; chef, assistant chef; 3 butlers; 2 housekeepers; 3 gardeners/ pool attendant; 3 security guards. Masseuse and babysitter on request. Villa Sepoi Sepoi is very well equipped for families. Equipment includes 2 baby cots; 2 high chairs; 2 car seats; baby monitor; DVDs; books; games, pool toys. Satellite TV and DVD player; sound system with CD player; Bose iPod dock; table tennis; Nintendo Wii; projector screen in living pavilion. Back-up generator; barbecue; safes; 3 bicycles. Weddings and events for up to 100 people can be accommodated.